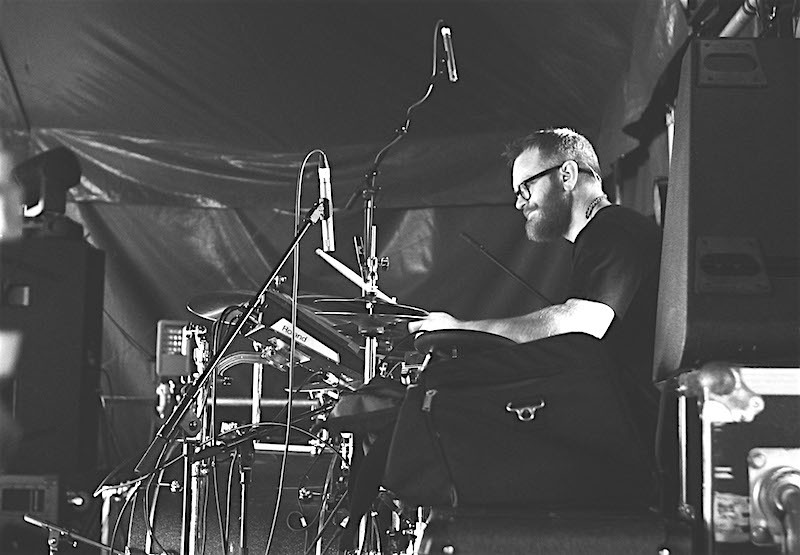 Adam Betts has been shaping young drummers careers as a tutor at the renowned BIMM London for years – amongst them mine – but his work outside the class room is even more impressive. 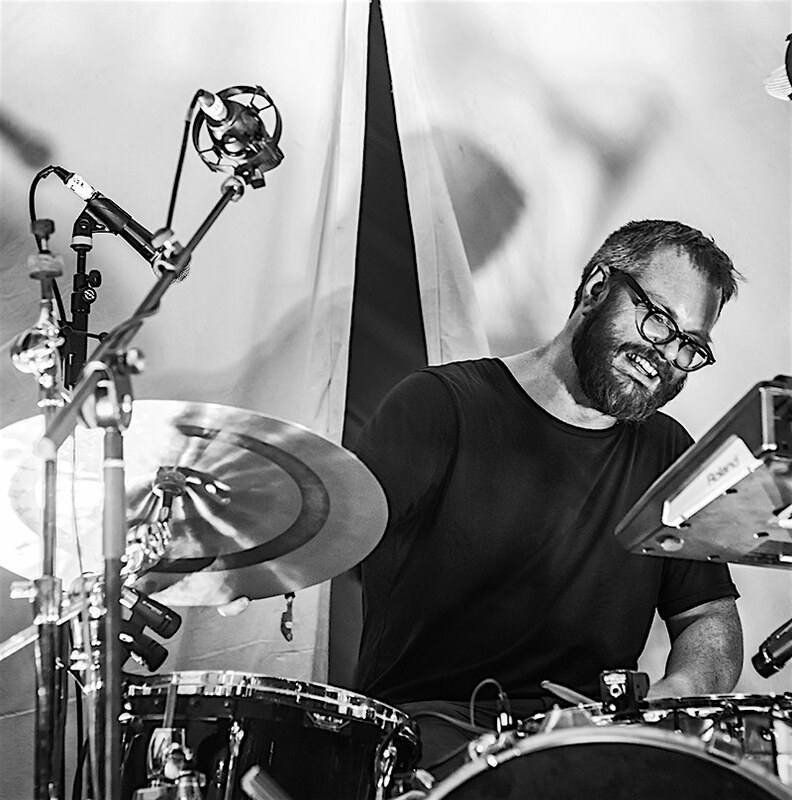 With a jazz degree from the Royal College of Music and a background in rock and funk drumming, Adam found himself touring the world with UK funk legend James Taylor, but his passion for electronic music soon saw him venture in this direction. 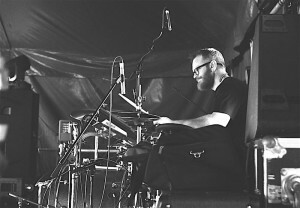 His original band ThreeTrappedTigers and his work with Goldie, Emperor Yes and The Heritage Orchestra all verify his place firmly in that genre. 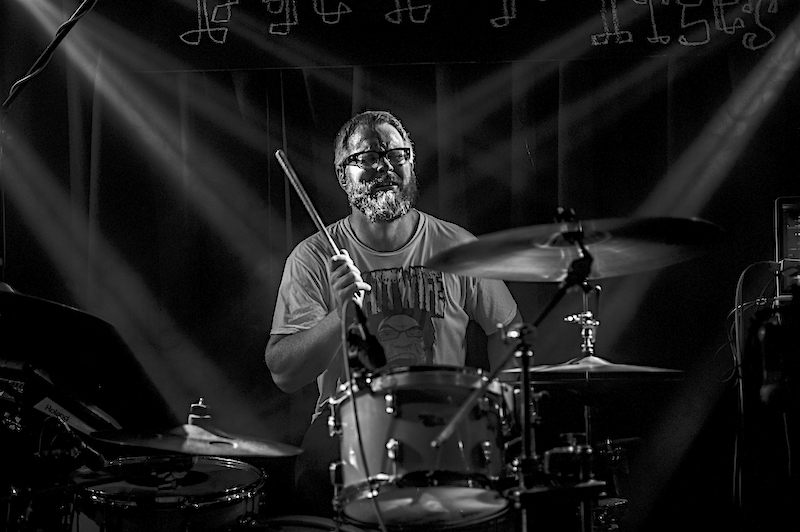 Frenetic grooves paired with a huge sound and an extensive knowledge in electronics make Betts an invaluable drummer for pretty much any current gig and promise only more to come for the future. When I was about seven I really wanted a trombone but my dad stepped in and bought me a drum kit. My dad is a saxophonist who plays jazz clarinet and saxophone so he was always keen for us to do something. I don’t really remember showing a massive interest in drums at first. The first few years were just ‘go and do some paradiddles, do this, do that’ and then at about 13 I got into Guns N’ Roses and Pantera and suddenly playing music in bands with your friends was actually really fun. That’s when it went from ‘something you do because your parents tell you to practice’ to actually something you could say something with. It became a real thing of identity, I think as it does for a lot of kids. You meet awesome people and get that kind of closeness you get in a band. So yeah, it became this absolute backbone in my teenage years in quite a few ways: rock bands with mates but also the Dorset Youth Jazz orchestra or something like that where you met different kind of people. Was that private lessons or at school? 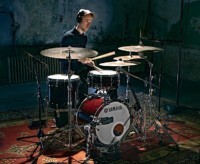 I had private lessons at first with a few drummers. As I said, my dad was a jazzer so he knew some guys and always had people he admired and would go “Oh, I’d love to get you lessons with him”. That was back in the days when it was just £10 to have an hour lesson. It was always 9am on a Saturday driving through Dorset to sit there with some guy for a lesson and then head back. Then at school I met a guy who was the drum teacher there and he was great. Also my music teacher at school was probably the one that I think played a big role. He took me along to the Bournemouth Youth Jazz Orchestra and that is where I then met all the musicians who were coming to London to study music. Those were the guys who were a bit more serious about it from slightly posher schools. They went: “Oh yeah, you can go to London and study.” I’d never even though you could do it. I just thought I’d give it a try and wondered into it. So you went to the Royal Academy to do a degree in jazz. Did you pick that course because of your dads background or have you always been interested in jazz yourself? Yes. It’s a weird one. There’s a funny thing at the academy and I’ve spoken to them about it when I did my teacher training: the jazz experience for most kids around the country and definitely for me is through doing school jazz bands, and it’s so different to small band jazz which is way more solos. In big band you learn the reading and all that lot and then in small band jazz conservatoire lessons the written music is kind of 30 seconds at the beginning and end and then you improvise for 20 minutes. That was way out of my comfort zone. I was taught big band and reading it and I enjoyed it. The jazz I liked, I loved, but I wasn’t really a jazzer, I was a rocker. Back then there was really just a year at DrumTech or study classical or jazz, there was no popular music degrees. So it was like: Ok, I’ll go and do a jazz degree. Luckily I was kind of good enough at jazz to get in but it wasn’t something that was obviously a passion. There is an element to it, the way you rip music apart and take it for your own playing that jazzers do that’s been really inspiring and became a key ingredient in my playing and approach to music. Mainly it was just like: Right, I wanna play drums for four years, I wanna move to London, let’s do that. And it was the plan to make music a career straight away? Yeah, I think it was always just a ‘do it till I can’t afford to do it anymore’ – and I’m quite stubborn. Towards the end of the degree I started teaching in Dagenham just being a peripatetic teacher at schools. I did that for about two or three years after the degree doing five days of teaching a week. I was playing with bands with friends at the time but not making any money. Then after about three years I had a real nice break where one of the guys at college invited me to try out for the James Taylor Quartet. I went to have a jam with James and it was great, we just clicked. I thought, that’s it, this is what a career in music is, I’ve done it. I talked to the guitarist about it and we were laughing about it. You get out of Uni and you land a gig like that. We did four years and it was amazing. You’re traveling the world, you don’t have to worry about money, it was amazing! Then you finish that gig and suddenly you realise: no, this is what a life of music is. 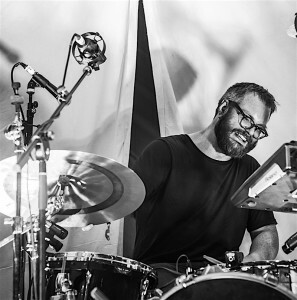 It was a pretty awesome experience in terms of learning how to be on the road and all this, but it certainly wasn’t a particular realistic experience of what it is like to be a musician, and then the real thing started after that. At some point I won’t be able to do it maybe and I’ll have to do something else, but I seem to be getting away with it so far. That’s the only kind of decider. So James Taylor was your first pro gig? Yes. There was some stuff before that, some real functioneering. When I was in Bournemouth when I was 18 one of my first gigging bands was pretty much a James Taylor Quartet tribute band, so I knew all of his tunes. We played lots of old groove and funk and that was always a real passion for me, the old dirty sounding, dusty funk. To play that with James was pretty much unique. I don’t think in the UK you can get closer to this stuff – especially with guys like Andrew McKinney on bass who has got that old school sound. When James gets really into it it sounds like a small Jimmy McGriff / Jimmy Smith kind of Hammond Quartet rather than the big budget disco stuff that there’s been in the 90s. You have jazz guitarists, lots of solos and you’re just playing funk. 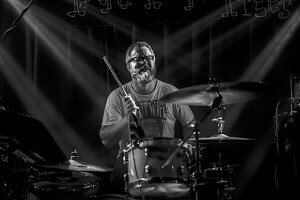 In terms of ripping the chops… we’d do a week in Greece where you do two 75 minutes sets in front of the same audience with a half hour break in the middle. It was a proper ‘f*cking man up’ and it was amazing for that. Lets talk about your original band ‘Three Trapped Tigers’(TTT). How did that come about? I was in a band called Optimist Club while I was in Uni. The guys in that were amazing and we did a really lairy, weird, Beef-Hearty, punk, artsy, math-sy kind of prog. It was real chaos and pure anger playing, smashing through cymbals like you wouldn’t believe. Through that I met Tom who is in Three Trapped Tigers. The third guy, Matt, has been one of my close musical buddies since Uni (I was at Uni with his twin brother John, Matt was at Guildhall at the same time). Meeting John and Matt I think have been the biggest influence on my playing – probably more than other drummers. Matt’s ear for rhythm is terrifyingly amazing and totally inspiring. TTT actually began as a four-piece but the bass player left after awhile. When we started playing together the only kind of music we could agree on was like Aphex Twin and Squarepusher. Me and Matt really love rock, Tom likes indie but not rock, metal or funk. Matt didn’t like post-rock and I’m sure there is stuff I don’t like. You had your first America Tour with TTT this year too. Yes. We’ve been trying to get out to the States with it for ages. We’re kind of at the end of the campaign to our last album, we finished touring that end of November. We were like ‘Well, lets start writing a new album’ and then got offered a trip to America to support the Deftones with Rise Against and Thrice. We were just in a scruddy van, we were the half past six openers, but it was pretty fun. We toured all the way down the East Coast over two weeks, from Chicago up to Toronto and all the way down to Miami. It was pretty amazing. So more ventures to America with that band? Hopefully. We’re just gonna write another album and see what happens but yes, we would love to go back. You also drum for the Heritage Orchestra. What an amazing gig! How did that come about? That one is another college one. Jules Buckley and Chris Wheeler were at Guildhall with Matt. Towards the end Chris was running a club night at Cargo and to celebrate the club night’s anniversary he said ‘Let’s do something ludicrous, let’s put together a 40 piece band’. So they were doing Blaxploitation / Isaac Hayes kind of music with a full orchestra and a funk band. After about three months of it going I finally got my feet under the table. I was like “Come on, you gotta let me do that! !” That was about 12 years ago. After a year of doing it we kind of parted ways. We were playing a lot of concert halls and I’m a loud drummer. It was early days for the Orchestra and I just got frustrated with it. After about five years of not doing anything with them Chris got back in touch. In that time they really upped their profile to have an amazing sound man and had worked with some other drummers who had played loud as well, so I was allowed to be me. Suddenly it was really doable and it was amazing. I think my playing had just matured to being a bit quieter as well, it wasn’t just “Rock out!”. My first project back was the Joy Division thing which was way more electronic and quite rock. It was really fun. Since then we’ve done a few projects. The Goldie thing was probably my favourite. It’s just two drummers, with some massive sub bass on stage, with an orchestra around you was definitely one of the most euphoric playing experiences I’ve ever had. That ‘Timeless’ album meant so much to people in ’94 and Goldie is an amazing and passionate guy. We just rocked out with it and all the heads that’ve been into it 20 years before were there reliving their youths taking a pill for the first time in ages. It was pretty amazing. The Pete Tong one has kind of been hilariously successful. It’s really fun music, fun to play and it was amazing for the band reaching a number one album. It’s really gone nuts. 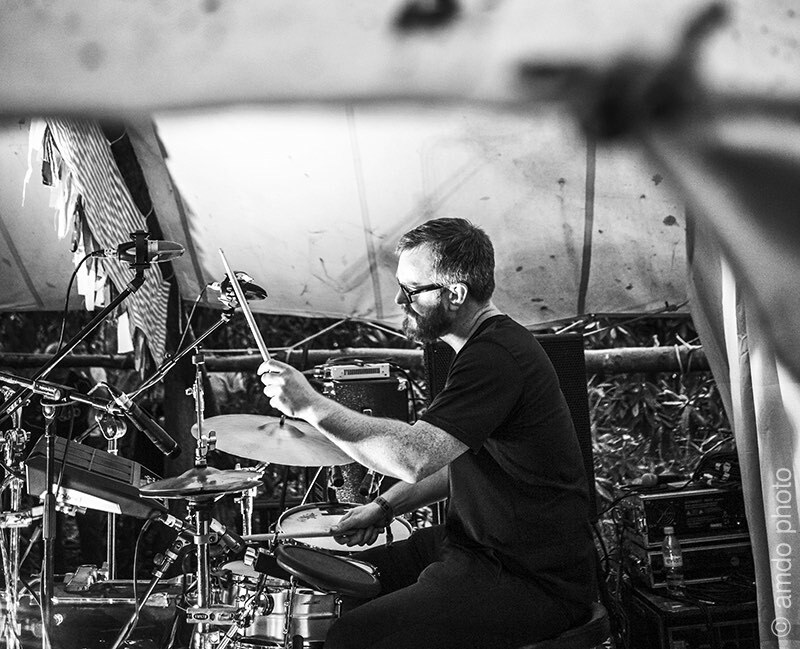 Late last year you released your first solo album ‘Colossal Squid’ which is an amazing crazy mixture of live drums and electronics. How did that whole idea come about? Obviously the kind of technological stuff that I do with Tigers and a little bit in the Heritage Orchestra as well was quite an inspiration. That got me tempted into the idea of trying to do stuff that sounded a bit more like Squarepusher rather than just rock drums. But then I also did some duos where I would be adding in some bass lines using a bit of Ableton trickery to have a cycle of notes that fit the part of the song and every time I’d hit the bass drum one of those would come out. So yeah, there are a few different things we used in some of those and I wondered how far I can push it and make some music. Also at the time TTT was quite quiet so I had some time to work on it and record it. It was way more about taking the plunge than it was about anything else. Just not having anyone to hide behind and just being like: this is my music, this is an album I think is worth putting out there. That kind of stuff was probably the hardest part. It was received pretty well and has kind of become a thing. Right now I’m gigging it, I’m touring it and I started on the second album. One of my tunes (Aneek) from that first album got used on an Apple advert which was fun. I actually nearly didn’t happen because the ad was for going out in the United Arab Emirates and in Arabic it turns out “Aneek” translate to “I’m f***” quite accurately with even the same spelling. I only called it that because it’s the name of my friend who gave me some of the samples for it. It was crazy. I was sitting in the back of the van on tour in America trying to change the name, running up a £200 phone bill. It was very, very funny. What can we expect from the second album? More crazy? I think it’s not more crazy, I think it will be more song based, more melodic. There is still some pretty fruity music in there but there’s also… I don’t know how to describe it, it’s just everything I’ve written since the last one. It’s probably a development on a lot of ideas of the last one. I’d say on the whole it’s more a muck about with MIDI rather than audio from the drum kit. The recording progress has been really fun. I’ve really gone in on the kit sounds trying to get something that sounds like the drum kit sounds that I love. Wondering how to record a kit that sounds like old breaks but make them work in a kind of electronic way. Played fairly light and mic’ing quite extensively. I used the ’62 Camco that I’ve got getting a quite old school sound and now trying to make it sit with a load of synths and effects is quite a fun challenge. You just mentioned Squarepusher as an influence. Now would I be leaning far out of the window by saying that the secret, unknown drummer of his new band ‘Shobaleader One’ has a very similar style to you? I know you also do some producing. Yeah, I haven’t really produced music for anyone else other than me for a while. I did some stuff with a singer a couple of years ago but that again was more practise for myself. All my albums are produced, mixed and recorded by me because I think while I’m not the best mix engineer in the business, I think I’ve got a very clear idea of what I want my thing to sound like. I really enjoy the production side. I actually do some commercial music, some almost library music stuff during my downtime. All of that is just practise though. It’s good to try things out. You’re also a lecturer at BIMM (former DrumTech, Tech Music School). Has teaching always been a passion? I think there is a lot of fun stuff to work on with drummers, especially drummers of degree age. That’s a really nice time to be teaching them. When I got first out of college I was teaching at some schools just to pay the bills and that was ok. There were some really nice kids and it was fun working on music with them. It was something they’d never seen before, something that was purely for your own enjoyment and development. These were kids who weren’t studying music at school, they just came for drum lessons. A lot of them will probably never touch a drum kit again but they had discovered something for themselves and enjoyed it. But you weren’t teaching the same lesson over and over again. The kids would come along and it became clear that some of them were there to get out of maths. You just sat there and it was quite contractual: let’s sit here for half an hour and work on something. You try and excite them but you get some kids who don’t even listen to music. To then move on to the degree stuff was great. 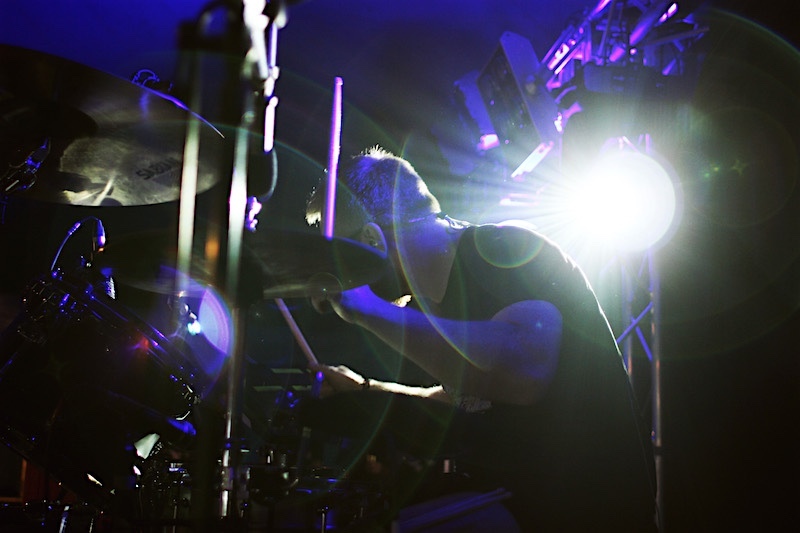 You’re working with real drummers and real musicians. 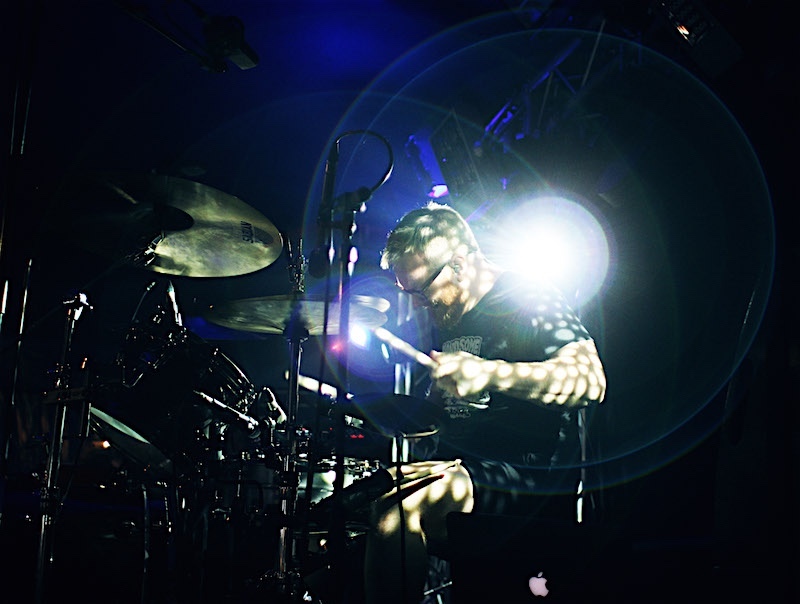 My angle on it always was that the difference between a drummer who works and one that doesn’t is so often not to do with what they do on the drum kit. It’s how they think about it and how they hear music. You have a lot of guys who have a good work ethic, a lot of discipline to practise and a good idea of how to improve their technique but if you don’t approach the kit in the right way outside of that, it still can struggle to come together. Not that I would ever say I totally have it together. But I think it has to come back to music and songs; and it has to come back to what everyone else is doing on stage and how what you do sits with that. It’s kind of developed now over the last ten years so I think I’m quite clear on it. It was always fun working with students on that. I talk about it in the past because it feels like I haven’t been there in ages with the holiday now and the touring before that. On the topic of teaching I became an associate with my old college this year which is a really nice honour. I went back to the Royal Academy and a bit of a do. That was great. Like I said, I’m finishing album number two but I don’t have a release date in mind for it yet. We’re also about to do more touring with the Heritage Orchestra Pete Tong / Goldie stuff later this year and hopefully next year there will be new Three Trapped Tigers and some more Heritage stuff. Thanks a lot for your time Adam!